The result was the piece above: at first sight, much the same as the original, but much slimmer and, although I don't show a photograph of it, a smoothly curving back. Again, it is polished to a satin smooth finish, and left unstained with the natural grain showing. Just a little linseed oil. Wow, all that, and I've not mentioned the design yet. The aforementioned son is a Buddhist, and this symbol is (as the title says) a dharma wheel; or, rather, a very simplified representation of what can be a quite ornate image. However, I think that the essential symbolism is still there. the points on the ends of the spokes represent insight. There are other versions of the wheels with differing numbers of spokes, each with their own symbolic meaning. One of the more familiar might be the 24-spoked Ashoka Chakra, a version of which is at the centre of the flag of India. So now you know. And you thought you came here to read about jewellery. PS, it's about 50mm across (so fairly large) and on a 4mm silicon rubber cord. 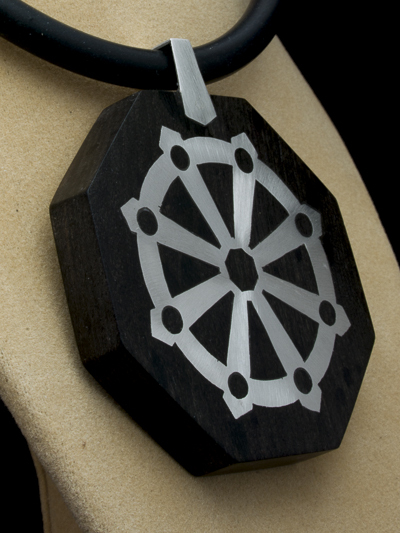 And it does feel great to stroke the back..
Natural ebony pendant inlaid with silver Buddhist symbol. I'll give you a few seconds to get over the shock of a photo that isn't all black! I did try photographing this against my normal black background but either the ebony blended into nothingness or, the detail of the brushed texture on the silver got lost. Ebony is a beautiful wood. It is very hard, so can be sanded to an extremely smooth finish. I actually made two version of this piece. The one below was done as a commission and I left it very angular and chunky. It was for someone's son's birthday present, so a more masculine feel was appropriate. I also understood that the recipient "knew about wood", so I decided to eschew the common practise of lacquering the wood or staining it (yes, the jet black stuff you usually see has probably been rubbed with boot polish). The result was that you can still be the grain in the wood and even little hints of the natural oils that are in it. But, more importantly, it feels silkily smooth and natural; very hard, but warm and sensual at the same time. Not long before this piece, I had made a piece called Pearl Divers, the basic shape being a little 'flying saucer'. One of the things I really like about that was how the gentle curve of the back felt so delicious to touch. So I set about combining that shape with the satin feel of the ebony.